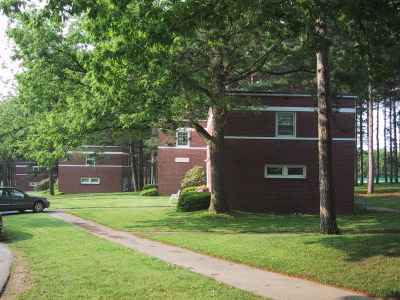 Merrill Apartments are five apartment buildings near Milliken Dormitory intended for young professors. Built in 1956, they were not the most popular choice for faculty at the time. 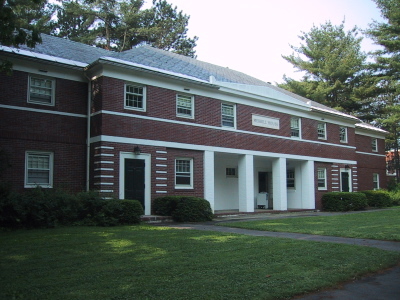 A Young Faculty Committee wrote to President Charles Cole on the matter, saying "First, we should like to record our disappointment in the choice of site. Without going into particular objections, as we did in our last report, we want to make only the general comment that, stated quite simply, the Infirmary area will not be a pleasant place to live" (Archives & Special Collections, Buildings and Grounds Collection, box 5, folder 98). (Photographs taken 1 June 2002).